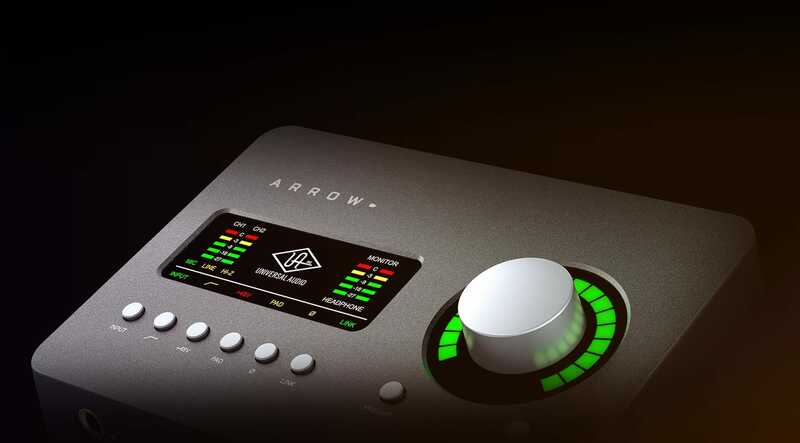 Beyond the included Realtime Analog Classics plug-ins, Arrow lets you tap into the full library award-winning UAD Powered Plug-Ins — including vintage EQs, Compressors, Reverbs, Tape Machines, Auto-Tune and more — in real time, and without taxing your computer’s CPU. With exclusive emulations from Neve, Ampex, Lexicon, Fender, Marshall, Antares, KORG, Moog, and more* the creative possibilities are nearly endless. *Arrow includes the “Realtime Analog Classics” UAD plug-in bundle. Other UAD plug-ins sold separately. Learn how to quickly connect, setup, and start recording tracks with real time UAD plug-in processing using an Arrow audio interface. Arrow requires a Thunderbolt 3-equipped Mac or Windows machine, and is not backward compatible with earlier versions of Thunderbolt. For more information, click here. ...for tracking on the go. I strongly recommend! My Arrow and Mac mini replaced an entire room of IO, processing cards with out loosing and sonic integrity. Thanks UA!! ... and I can easily bring it just about anywhere, when on the road. Feels solid, looks great, sounds perfect! En utilisant la console virtuelle avec les plug in UA je retrouve la qualité de mes preamps analogue. Je vais diminuer mon inventaire considérablement. IMPRESSIONNANT!!! Nagyon gyors hangkártya ezért magasra tudod a buffert állítani és így ugyan azzal a processzorral több erőforrásod lesz. A hangja kíválló. Fejhallgató erősítője is nagyon jò thunderbolt 3 tápellátással. Nem tudok ennél jobb választást ebben az árban ha nincs szükséged sok ki és bemenetre. 192/32-ben 2,1ms késéssel tudsz cubase-ben dolgozni. Imádom. I'm using it as a home studio device. Althought there's only one DSP, it's alright for me because I record with the plugins directly during the take. I use it with a SM7B microphone, and a Gibson es-390, and I get very good sound out of it. Also, no latency, no crash nor bugs - I've used it on iMac and MacBook Pro. First of all, I particularly like its compact shape, and its sound quality is surprising. It's really cool to use only one type C to power without extra power. I can take it with me and the Macbook pro to form a mobile audio workstation. The free plug-in is also very good in timbre. It basically meets the needs of ordinary recording. And many plug-ins, which I use logic x to bring with me, have a very good effect. Sound, size and the value for $. I am very impressed with the UAD Arrow. The workflow is intuitive and the plugins sound great. I have been searching for the classic 70s sound for years now in my homestudio, and this is a big step towards achieving that goal. Love the UAD Arrow. Still need to work through signal paths with Logic. I wish I could use Logic & 3rd party plugins in the Console to utilise Arrow processing power. Been in the industry for years. UA is a solid company with an outstanding product. PC or Mac, it just works and sounds flipping great. Great plug ins latency free. For a guitar guy its perfect. I love it. I guess it's a good piece of gear if you can ever get it to work properly. Customer services isn't very responsive. I wanted this to be a better experience but I truly don't know if this product is worth the headache. I wish I could get some help. I have had the Arrow for 3 weeks now and I fund it to be average all around. I had to get an USB-C audio interface for my MacBook Pro and this was the only choice. I am still struggling with a sync issue when playing or recording in cycle mode; the playhead keeps jumping back to the start in a sporadic manner. Two weeks after purchase I am still in consultation with UAD technical service attempting to get an Arrow interface to work with a recently purchased Lenonvo Thinkpad P52. I was looking to get the best possible signal chain for recording vocals and almost bought an analog pre amp. The Arrow was an awesome decision because I solved 2 problems at once with a smaller investment. I now have what I believe to be a true Neve record channel and eliminated my latency issues all in one shot. I also am now a member of the UAD plug in fan club. Everything you need to record a song. The Arrow has been excellent for use in conjunction with my MacBook Pro and Ableton. The design and performance quality have exceeded my expectations. I was tracking within a few minutes of unboxing it. I have read a few reviews that say it is noisy and I have not found that to be the case at all. I have used it for guitar, bass, vocals, and miked percussion and it has worked well in every instance. I also see a common issue is that some users think the processing power is limited, but I think that is really quibbling with such a small unit. If you are using an Arrow as a cheap entry into UAD plugins then you probably should have purchased a more robust unit. As an interface it is absolutely user-friendly and clean. A huge bonus is the Unison mode which allows you to track through selected plug-ins. I have had great results using the Manley VoxBox plug-in in this way for vocals. Again if you want to load up stacks of plug-ins and never print to audio you are going to need much more processing power. But I guess I would ask any of you who record like that, why do you record like that?